Ancient Jerusalem sits on several hills. West border is Hinnom Valley which turns to run along the south side also and meets the Kidron Valley. The north border is not marked with valleys but is easily approachable and was the most difficult to defend against approaching armies, thus, the fortresses and towers were built on the north side of the city. The Central Valley today runs from just north of the Damascus gate along ha-Gai Street. The Central Valley would separate today’s Temple Mount from the Jewish Quarter. The Central Valley distinguished the Eastern Hill (City of David) from the Western Hill (which was where the city expanded to during the time of the Kings). Mount Zion sits on the south end of the Western Hill and the Hinnom Valley bends around Mount Zion’s west and south sides. The Gihon Springs are on the eastern slopes of this eastern hill and provide the water source for the city while also watering the Kidron Valley. Mount Moriah sit immediately to the north of the City of David and is, in a sense, part of the eastern hill. The area between the City of David and Mount Moriah on this eastern hill is called the Ophel. After Abram returned from defeating Kedorlaomer and the kings allied with him, the king of Sodom came out to meet him in the Valley of Shaveh (that is, the King’s Valley) (probably where the Kidron and Hinnom Valley’s meet). Then Melchizedek king of Salem (Jerusalem) brought out bread and wine. He was priest of God Most High, and he blessed Abram, saying, “Blessed be Abram by God Most High, Creator of heaven and earth. And blessed be God Most High, who delivered your enemies into your hand.” Then Abram gave him a tenth of everything. Jerusalem and served God on Mount Moriah. Melchizedek and the place to which God had led Abraham for worship. Later in Joshua 12:10, Adoni-Zedek the king of Jerusalem, is found on a list of 31 kings from the land of Canaan who were killed by Joshua. After Joshua’s death (Judges 1:1-2) the men of Judah attacked and destroyed Jerusalem, but it appears they did not occupy it at that time. This led to the resettling and fortification of Jerusalem by the Jebusites. Even though the king of Jerusalem was killed in battle against Joshua, and the men of Judah destroyed Jerusalem in the following generation, the Israelites did not conqueror and occupy the fortress city of Jerusalem for another 400 years. David called Jerusalem (also called Jebus, Salem, etc.) the City of David after he took it from the Jebusites. The hill on which the city was built and the hill just north of it (Mount Moriah) together became known as Zion. The Millo is part of the City of David—built by the Jebusites before David conquered it. The Millo consists of the terraces and retaining walls on the eastern slope of the southeastern spur that supported the buildings above. Kathleen Kenyon has uncovered part of this “Stepped Stone Structure,” and Eilat Mazar has excavated what is now known as the “Large Stone Structure” that sat on the Millo. David built his House of Cedar, or royal palace, on the Millo (2 Samuel 5:11). The Tower of David was also built there (Song of Solomon 4:4), as was “the house of the mighty men” (Nehemiah 3:16). David then extended the city’s walls and fortress to the north of the eastern hill of the City of David up onto the Ophel toward Mount Moriah, or the Temple Mount. The walls that Solomon built to close up the breach created by David’s building projects have been uncovered and are detailed in this book. Solomon also began construction on Mount Moriah in preparation for building the Temple. The difference in price recorded in 2 Samuel and 1 Chronicles is because the verses in 2 Samuel record the price of the threshing floor and the oxen (fifty shekels of silver) while the verse in 1 Chronicles records the price for the entire site where the threshing floor was located (600 shekels of gold). David purchased what we would today call the Temple Mount for 600 shekels of gold. David’s descendents have never sold what David purchased that day. Temple Mount that Solomon would later construct in approximately 960 BC (2 Samuel 7). Solomon spent seven years building the Temple. Solomon’s palace was built just south of the Temple Mount on the Ophel. The palace project took 13 years and included the entire palace precinct— the House of Pharaoh’s Daughter, the throne room, the Hall of Columns and the House of the Forest of Lebanon. Solomon also built up the City of David and its fortifications. Part of the city wall that Solomon built has been discovered and was excavated in 2010. The kings that followed David and Solomon continued new construction in the City of David, the Ophel and the Temple Mount. They also expanded the city westward. The biblical chronicles of the kings record that on several occasions they undertook major restoration projects. repairing went forward in their hands, and they restored the house of God to its proper condition and strengthened it. Uzziah built towers in Jerusalem at the Corner Gate and at the Valley Gate and at the Angle, and fortified them. . . In Jerusalem he made engines, invented by skillful men, to be on the towers and the corners, to shoot arrows and great stones. This wall is also mentioned in Nehemiah 3:8 and 12:38. It was built of stones from houses that were torn down to get the rock and other material. It is called “the Broad Wall” because it is 21 feet wide. A 210-foot section of this wall has been discovered. Manasseh (697-642 BC) – When Manasseh returned from his Assyrian imprisonment in Babylon: He built an outer wall for the city of David west of Gihon, in the valley, and for the entrance into the Fish Gate, and carried it around Ophel, and raised it to a very great height. - 2 Chronicles 33:4 Manasseh added a wall east of the City of David to protect the homes outside the city walls that had been built on the slopes of the Kidron Valley. Rule by the Persian Empire that Nehemiah had served under was replaced by Grecian rule in 332 BC when Alexander the Great entered Jerusalem. The Jewish high priest, Jaddua, met Alexander outside the city walls and showed him the scroll of the prophecy of Daniel which foretold the coming of the four-winged leopard and the goat from the west. Both of these identified Alexander as the next conqueror of the Middle East. Alexander and the Greeks then worshipped in Jerusalem. Alexander promised theJews their city and told them their Temple would never be defiled by the Greeks. The promise was good for 160 years until 172 BC when the Grecian king of Syria, the Seleucid king Antiochus Epiphanies, executed the righteous Jewish high priest Onias III and replaced him with wicked men such as Jason and Menelaus who plundered the temple. In 168 BC Antiochus attacked Jerusalem, burning and looting homes then selling the women and children into slavery. There were 22,000 Syrian soldiers stationed in the Akra, a fortress built on the Ophel south of the Temple Mount looking north over the Temple courts and activities. The temple was plundered and desecrated, and on December 25, 168 BC, Antiochus set up an altar to Zeus to replace the Jewish altar of burnt offering. The Hasmoneans ruled until the Roman general Pompey entered Jerusalem in 63 BC amid civil war between two Hasmonean brothers and their political Hasmonean government continued to deteriorate until 47 BC when Julius Caesar appointed Antipater, Herod the Great’s father, to be the manager of Caesar’s affairs in Jerusalem, Judea, Samaria and Galilee. Antipater immediately began rebuilding the walls of Jerusalem that had been damaged during the previous 123 years of fighting. After Antipater was poisoned in43 BC (a year after Julius Caesar was assassinated in Rome), his son Herod was appointed by Marc Antony as the ruler of Judea. Hadrian renamed Jerusalem "Aelia Capitolina" after the Jew's second revolt against Rome in 130-135, and rebuilt it as a Roman city. Jews were forbidden entrance into the city except once a year to mourn their fallen Temple. Emperor Hadrian decided to turn Jerusalem into a Roman city and called it Aelia Capitolina. Hadrian’s decision may have been the final factor in causing the Bar-Kokhba Revolt. Or the Bar-Kokhba Revolt may have been the final factor in causing Hadrian’sdecision. The history of this event is not clear, but either way, Hadrian won the war, and Jerusalem was converted into a Roman city with the status of Roman colony. Aelia refers to the clan name of Hadrian’s family: Publius Aelius Traianus Hadrianus. Capitolina refers to the Capitoline Triad of supreme deities in Roman religion who were worshipped on Rome’s Capitoline Hill: Jupiter, Juno and Minerva. Hadrian also renamed the land of Judea after the ancient enemies of Israel in the Old Testament, the Philistines. Judea became known as Palestine, or the land of the Philistines, and Jews were forbidden by Roman decree from entering Jerusalem except once a year on the date of the Temple’s destruction. Interestingly, the date of the Roman destruction of the Temple in 70 AD was exactly the same as the Babylonian destruction of the Temple in 586 BC. Hadrian’s projects in the city of Aelia Capitolina included building a temple to Jupiter on the Temple Mount right on top of the destroyed Jewish Temple. He hoped that the presence of a temple to a Roman god on the site would stamp out any Jewish hope of recovering and rebuilding their city. A statue of Hadrian was also placed on the Temple Mount. Hadrian’s successor, Antoninus Pius, placed a statue of himself there as well. A broken piece of this statue’s inscription can still be seen today in the southern Temple Mount wall above the Double Gate. The location of Jesus’ death, burial and resurrection was also covered up by Hadrian when he built a retaining wall over the site. He used fallen Herodian ashlar stones from the Jewish Temple Mount to build the wall, and filled in the area with soil to form a platform upon which he erected a statue to Jupiter and a temple to Venus. Citadel. A Roman pillar still stands in that area with an inscription left by the Tenth Legion. Archaeological evidence indicates that after the Bar Kokhba Revolt they may have moved to or extended their camp to include the Temple Mount. In 313 Constantine declared Christianity a legal religion with the Edict of Milan. Then in 324, he united the eastern half of the Roman Empire with his western half, and Christianity became the dominant religion in Jerusalem until the Muslims conquered it in 638. Constantine created a new capital for the Roman Empire, moving it from Rome to the city of Byzantium on the coast of northwest Asia Minor at the crossroads of Europe and the East. This newly united and Christianized Roman Empire, which ruled Jerusalem until the Muslim conquest in 638, is known today as the Byzantine Empire. Constantine called his new Roman capitol city Constantinople. Many of the treasures of Rome were moved to Constantinople, or modern day Istanbul, the largest city in Turkey. There was a brief interruption of the Christian dominance in Jerusalem in 361 when the last sole survivor of Constantine, his nephew Julian, began to rule. Julian was known as “the Apostate,” and because he despised Christianity he annulled the anti-Jewish decrees and gave the Jews permission to rebuild their Temple. On their (Jews) replying (to Julian’s order to build the Temple) that because the temple in Jerusalem was overturned, it was neither lawful nor ancestral to do this in another place than the metropolis out of which they had been cast, he gave them public money, commanded them to rebuild the temple, and to practice the cult similar to that of their ancestors, by sacrificing after the ancient way. The Jews entered upon the undertaking, without reflecting that, according to the prediction of the holy prophets, it could not be accomplished. They sought for the most skillful artisans, collected materials, cleared the ground, and entered so earnestly upon the task, that even the women carried heaps of earth, and brought their necklaces and other female ornaments towards defraying the expense. The emperor, the other pagans, and all the Jews, regarded every other undertaking as secondary in importance to this. Although the pagans were not well-disposed towards the Jews, yet they assisted them in this enterprise, because they reckoned upon its ultimate success, and hoped by this means to falsify the prophecies of Christ. Besides this motive, the Jews themselvesm were impelled by the consideration that the time had arrived for rebuilding their temple. When they had removed the ruins of the former building, they dug up the ground and cleared away its foundation; it is said that on the following day when they were about to lay the first foundation, a great earthquake, occurred, and by the violent agitation of the earth, stones were thrown up from the depths, by which those of the Jews who were engaged in the work were wounded, as likewise those who were merely looking on. The houses and public porticos, near the site of the temple, in which they had diverted themselves, were suddenly thrown down; many were caught thereby, some perished immediately, others were found half dead and mutilated of hands or legs, others were injured in other parts of the body. When God caused the earthquake to cease, workmen who survived again returned to their task, partly because such was the edict themselves interested in the undertaking. Men often, in endeavoring to gratify their own passions, seek what is injurious to them, reject what would be truly advantageous, and are deluded by the idea that nothing is really useful except what is agreeable to them. When once led astray by this error, they are no longer able to act in a manner conducive to their own interests, or to take warning by the calamities which are visited upon them. The Jews, I believe, were just in this state; for, instead of regarding this unexpected earthquake as a manifest indication that God was opposed to the re-erection of their temple, they proceeded recommence the work. But all parties relate, that they had scarcely returned to the undertaking, when fire burst suddenly from the foundations of the temple, and consumed several of the workmen. This fact is fearlessly stated, and believed by all; the only discrepancy in the narrative is that some maintain that flame burst from the interior force an entrance, while others say that the fire way the phenomenon might have occurred, it is equally wonderful. A more tangible and still more extraordinary prodigy ensued; suddenly the sign of the cross appeared spontaneously on the garments of the persons engaged in the undertaking. These crosses were disposed like stars, and appeared the work of art. Many were hence led to confess that Christ is God, and that the rebuilding of the temple was not pleasing to Him; others presented themselves in the church, were initiated, and besought Christ, with hymns and supplications, to pardon their transgression. If any one does not feel disposed to believe my narrative, let him go and be convinced by those who heard the facts I have related from the eyewitnesses of them, for they are still alive. Let him inquire, also, of the Jews and pagans who left the work in an incomplete state, or who, to speak more accurately, were unable to commence it . After his death, Julian was replaced by Emperor Jovian who reestablished Christianity as the religion of the Roman, or Byzantine, Empire. The temple to Jupiter that had been built by Hadrian and the statues of Hadrian and Antoninus may have been removed by the Christians of the Byzantine Empire between 324 and 361, or they may have been removed by the Jews during Julian’s reign from 361-363. This is Jerusalem from the time of the Bordeaux Pilgrim's visit from Gaul in 333 until the Muslim invasion of 638. The Bordeaux Pilgrim's written account of his visit is traced with the dotted line beginning on the east side, just outside the Temple Mount. 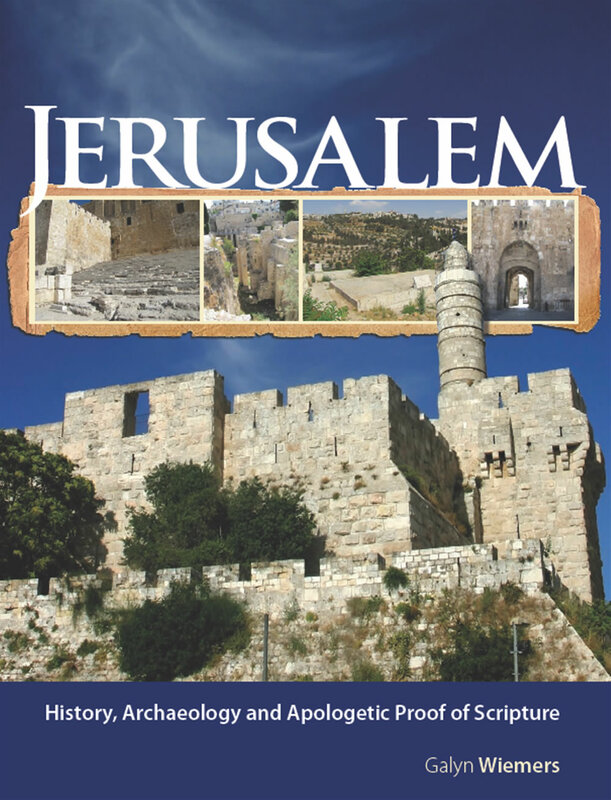 A Christian pilgrim who traveled to Jerusalem in the year 333 from Bordeaux in southwest France gives us a few interesting details about Jerusalem and the Temple Mount during the reign of Emperor Constantine. Below is what the Bordeaux Pilgrim wrote in 333 concerning what he saw in Jerusalem. Keep in mind that this is what he understood based on what he saw and what these locations were called at that time. There also is the chamber in which he sat and wrote the (Book of) Wisdom; (This chamber was called Solomon’s Stables by the Crusaders and still is today.) this chamber is covered with a single stone. There are also large subterranean reservoirs for water and pools constructed with great labor. And in the building itself, where stood the temple which Solomon built, they say that the blood of Zacharias (Matthew 23:35; Luke 11:51) which was shed upon the stone pavement before the altar remains to this day. There are also to be seen the marks of the nails in the shoes of the soldiers who slew him, throughout the whole enclosure, so plain that you would think they were impressed upon wax. There are two statues of Hadrian, (One of Hadrian and the other of Antoninus Pius. The inscription stone of Antoninus’ statue can still be seen today in the Southern Temple Mount Wall above the Double Gate) and not far from the statues there is a perforated stone (This is the bedrock of Mt. Moriah where the Ark of the Covenant sat in the Most Holy Place in the Temple of Solomon. This perforation, or carved out and leveled depression, can be seen inside the Dome of the Rock and is the same size as the Ark of the Covenant.) to which the Jews come every year and anoint it, bewail themselves with groans, rend their garments, and so depart. 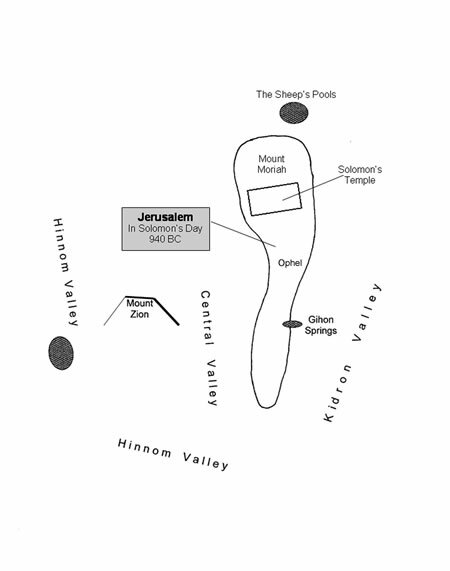 There also is the house out of Jerusalem to go up Mount Sion, (i.e., after leaving the Temple Mount and heading south out of the city on the main road, the Cardo Maximus) on the left hand, below in the valley, beside the wall, is a pool which is called Siloe (Pool of Siloam, John 9:1-11) and has four porticoes; (The four porches refer to Hadrian’s reconstruction in 135 AD. The Church of Siloam, was built in 450 AD, and its pillar bases can still be seen today in the water when exiting Hezekiah’s Tunnel.) and there is another large pool outside it. This spring runs for six days and nights, but on the seventh day, which is the Sabbath, it does not run at all, either by day or by night. (This pool called Siloe, or Siloam, was still being fed water from the Gihon Springs on the east side through Hezekiah’s Tunnel. The flow of water from the Gihon Springs has always been known for gushing water intermittently. In fact, “gihon” means “to gush forth.” The people of this time did not know of Hezekiah’s Tunnel. In fact, Josephus himself always calls Siloam a spring of water indicating that th eJews of 70 AD had forgotten about Hezekiah’s Tunnel even though it continued to supply water to the Pool of Siloam.) On this side one goes up Sion, (walking outside the city walls around the Westside along the Hinnom Valley and up Mount Zion) and sees where the house of Caiaphas the priest was, (just outside today’s walls and part of the extended Armenian Quarter, Matthew 26:57- 68) and there still stands a column against which Christ was beaten with rods. (Matthew 26:67-68 records spitting, striking and slapping at the High Priest’s Palace, but no rods.) Within, however, inside the wall of Sion, is seen the place where was David's palace. (This is the Citadel which was the fortress of the Macabees, the palace of Herod, and the camp of the Tenth Roman Legion. Today this Citadel and its remains are just inside the city walls by the Jaffa Gate.) Of seven synagogues which once were there, one alone remains; the rest are ploughed over and sown upon, as said Isaiah the prophet. (Isa 1:2.4-8; Micah 3:9-12) From thence as you go out of the wall of Sion, as you walk towards the gate of Neapolis, (This would be in the location of today’s Damascus Gate and was the grand new, or “nea” entrance to the Cardo.) towards the right, below in the valley, (Kidron Valley) are walls, where was the house or praetorium of Pontius Pilate. (Fort Antonia, Matthew 27:11-31) Here our Lord was tried before His passion. (by Pontius Pilate.) On the left hand is the little hill of Golgotha where the Lord was crucified. (As the Pilgrim walked up the Cardo towards the Neapolis Gate, the Church of the Holy Sepulcher was on his left, and the remains of Fort Antonia further on his right, Matthew 27:33-37) About a stone's throw from thence is a vault wherein His body was laid, and rose again on the third day. (The tomb and Calvary were in the same garden in the gospels and are located in the same Church of the Holy Sepulcher both today and in 333 AD, Matthew 27:57-60; 28:1- 10) There, at present, by the command of the Emperor Constantine, has been built a basilica, that is to say, a church of wondrous beauty, having at the side reservoirs (Cisterns were cut into the abandoned quarry. The remains of cisterns are found in the lower parts of the Church of the Holy Sepulcher.) from which water is raised, (Holes in the arched ceiling were used to lower buckets on ropes from the homes above and can still be seen in the ceilings of these cisterns today.) and a bath behind in which infants are washed. (i.e., baptized). Also as one goes from Jerusalem to the gate which is to the eastward (the Golden Gate) in order to ascend the Mount of Olives, is the valley called that of Josaphat. (Kidron Valley) Towards the left, where are vineyards, is a stone at the place where Judas Iscariot betrayed Christ; (Gethsemane, Mount of Olives, Matthew 26,36-50) on the right carried off and strewed in the way when Christ came. (Matthew 31:8) Not far from thence, about a stone's-throw, are two notable tombs of wondrous beauty; (There are tombs in the Kidron known today as the tombs of Absolom and Zechariah, but they cannot be theirs since they were built in a Greek style with Egyptian and Syrian influence probably around 100 BC-30 AD.) in the one, which is a true monolith, lies Isaiah the prophet, and in the other Hezekiah, King of the Jews. (These tombs can still be seen today, but, although the identification was believed to be true at the time of the Pilgrim, it was not accurate.) From thence you ascend to the Mount of Olives, where before the Passion, the Lord taught His disciples. (Matthew 24-25) There by the orders of Constantine a basilica of wondrous beauty has been built. Not far from thence is the little hill which the Lord ascended to pray, when he took Peter and John with Him, and Moses and Elias were beheld. (This event occurred in Caesarea Philippi, in Matthew 17:1-8, not here on the Mount of Olives as the Bordeaux Pilgrim believed). This ends the 333 AD account of the Bordeaux Pilgrim. and were given permission to return. The years 660-750 AD are known as the Umayyad period. The Dome of the Rock was completed by Caliph Abd Al-Malik in 691, and the al-Aqsa Mosque was completed by Caliph al-Walid in 701. Jews were in charge of sanitation on the Temple Mount until 717. During this time, a Muslim historian, al-Muqaddasi (946-1000), wrote that Jerusalem was mostly filled with Jews and Christians and was lacking educated Muslims. In those days non-Muslims and even Jews were active on the Temple Mount. Over the next 1300 years at least ten different empires or dynasties would rule in Jerusalem until the British defeat of the Ottoman Empire during World War I in December of 1917. In 750 AD the Abbasid Period began. The Jews were allowed into the city, and they even helped guard the Dome of the Rock on the Temple Mount. Rock was re-consecrated by the Christian Crusaders as the “Temple Domini” (“Temple of the Lord”) and the Al-Aksa Mosque was renamed the “Temple Salomonis” (“Temple of Solomon”). The period of the Crusaders lasted from 1099 to 1187. In 1187 Saladin retook the city from the Crusaders and the Ayyubid period began (1187-1229). The Jewish community in Jerusalem once again grew. The Dome of the Rock and Al Aksa Mosque were restored to Islam, and the walls were overlaid with marble bearing Arabic inscriptions. Five years later in 1192 Richard the Lionheart failed to take Jerusalem for the Crusaders but Saladin did grant Christians permission to worship in Jerusalem. The walls built by the Ottoman sultan Suleiman the Great in 1537 still stand today. Notice that Mount Zion and the City of David to the south are outside the walls. This can be confusing to people today because the original city of Jerusalem that David conquered is not inside the walls of today’s Old City of Jerusalem. Suleiman the Magnificent rebuilt them in 1537.
the Ayyubids from Cairo recaptured Jerusalem. Nachmandides, and poet/philosopher Judah Halevi. Mamluk reign until they were built in 1537-1541.
more Jews back to Israel. began to rebuild the walls of Jerusalem that same year. was again enclosed. These are the walls we see today. began building the “Hurva” Synagogue. to be an independent state under the rule of the Jews.